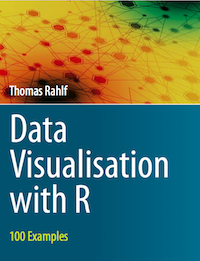 Thomas Rahlf, Data Visualisation with R – 100 Examples, Cham: Springer 2017, XVI, 387 p., four-color print. 19 b/w illustrations, 162 illustrations in colour. eBook ISBN: 978-3-319-49751-8, Hardcover ISBN: 978-3-319-49750-1. The book introduces the basics of designing presentation graphics with R by showing 100 full script examples: bar and column charts, population pyramids, Lorenz curves, scatter plots, time series representations, radial polygons, Gantt charts, profile charts, heatmaps, bumpcharts, mosaic and balloon plots, a number of different types of thematic maps. All examples use the Base Graphics system from R. For each example, real data will be used. Construction and programming is explained step by step. You can download all scripts and freely available data from Springer’s website extras.springer.com.